This fall I spent a lot of time sitting at my computer submitting work to shows, applying for grants and answering questions. And while it's not necessary to have a creative writing background for these things, it does take the edge off, kind of like when your husband hands you a gin and tonic over top of the bickering children and the smoking pot on the stove. (That's a terrible simile, implying that while one doesn't need a drinking background to parent and cook dinner, a person may find it helpful). One of the more creative computer-bound opportunities I did have was for Mabel Magazine, who asked if I would write about creating art in Alaska for their "Living..." segment. This is the first time my writing and textile art have appeared together in print, and I was beyond thrilled when my copy appeared in the mail this week. Mabel was founded two years ago by Liz Kalloch and Stefanie Renee, two creative San Francisco Bay Area women committed to print and creating a magazine that offers "real stories about real issues that people face with their creative endeavors, with their businesses and in their lives." The current issue's theme is "What's Next," and these well-written essays explore all the ways creative women have come to terms with what is next for them, whether it's rebounding from a work layoff, losing a loved one, staying open to the unknown or committing to staying right where they are. ​I'm honored to be in such good company. Mabel isn't available to read electronically (on purpose), but you can certainly order your real copy online. I showed it to a friend of mine yesterday and she said the same thing my husband said when it arrived, "Oh! This is such a nice magazine!" It really is. The writing is thoughtful, the photographs are gorgeous, the paper is lovely, the layout is beautiful. I'm really thrilled to be a part of something so well conceived and executed. This is the final group of boogie-woogiers. If you missed group 1 and group 2, I think it's worth following the links back to see how other artists are getting out "what's in them." Many thanks to all who participated in this inspiring journey of stories and images -- both to those who shared and to the rest of who followed in a long, snaking boogie-woogie line. The call out is officially over, the curtain has closed on this series. There may be an encore in the future of this blog, however, so check back if you think you hear some heels clicking on the stage. 'Cause it's in him and it's got to come out. "... the use of Sheers here make it a fragile and one time thing. I am not sure I could ever sell in in fear it will start to deconstruct. It is also a bit of a journey of a typical quilter starting with the "maze" of straight line quilting, from which we need to free ourselves. Then learn some prideful fancy free motion quilting. Then decide to cover all that with some stretched out renditions of flying geese. There is a second color on the underneath that does not even show unless there is a bit of a breeze. Somehow all of these stages just HAD to be done." " ... I have always in the past been able to use sewing as a distraction, but it had not been going that way lately. I know by getting this chaos out of the way, that I can move forward, but this will certainly be a progressive piece until the end is reached [...] my boogie-woogie is a journey that will be long, but will also be a time for healing." Lynn Langley, work in progress. "... When I finished my first naturally dyed square, a door opened through which I glimpsed tablesetting as ceremonial placemaking. The tablecloth itself was the first one that took on its own life as I made it, moving from a simple design based on my backyard clematis to a textile echoing with barely ascertainable associations ... like sinking Venetian palazzos or Sleeping Beauty's castle. Unseen elements like those that made our dinner parties so varied and engaging became apparent in the cloth and I realized that those elements, like roots, permeate everything. The weather, the season, the occasion, the ancestors, the taboos, the craft traditions, the aesthetic judgements, the interpersonal connections, the life and the love ... all weaving together to underscore and enhance ordinary daily existence, including dinner. My boogie woogie is making table settings that elicit life when we gather to share food, seeking nurturance on many levels..."
Dana Webb, "Clematis." Table linen.
" ... The first (collage landscape was) inspired by my missing my granchildren who lived in California and I lived in Tennessee at the time. Looking out the window on my plane ride back home, I thought of distance, miles, and a cloth slowly formed in my mind, a landcape of the heart. It took me a long time to stitch and an ever longer time to get over my angst at the back side of my cloth that looks like a thread road map that is falling off the cliff but this first big, dyed and stitched cloth of note has sparked a continuing love affair with dye, cloth, needle and thread." "... when I first heard Roderick singing 'A Life of Crime' with his band Sourpuss back in 1976 I wanted to illustrate it. 35 years later I got 'round to it [...] we will launch the limited edition of 100 hand coloured copies in September of 2016 at Artsite Gallery here in Sydney with an exhibition of the original drawings, accoutrements & a gathering of musicians from the past 40 years, it will be a party!" 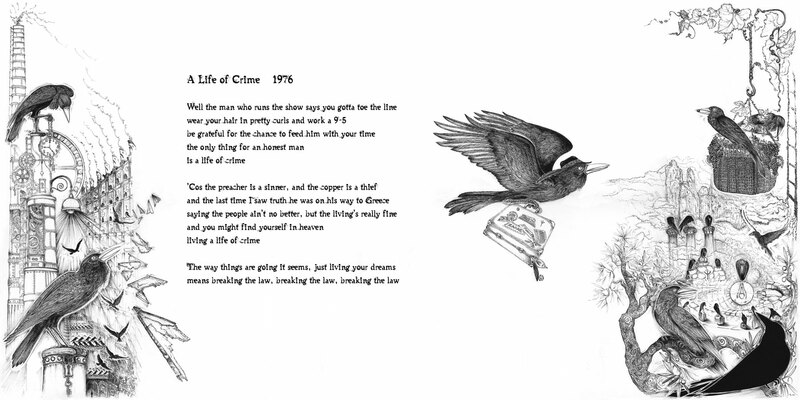 Mo Crow, "Life of Crime." Oh all you Boogie-woogiers, you rock. Thank you for taking the time to contact me and share your work. I'm inspired and blessed by your creativity and words. Someday we'll go shake up that rickety stage again. The original post is here: Boogie-woogie. Get down. This is the second installment of the boogie-woogie artist call out -- many thanks to all the artists who contacted me with their meaningful work. If you missed group 1 of the boogie-woogiers, I highly recommend you check out those pieces, too. I've included portions of accompanying stories here, but know that most of these inspiring journeys have been long and multi-faceted. They are therefore revered in this space. "I made a prayer shawl for a dear friend. It took a year. It turned on my artistic inspiration brain [...] We both lost our sons and met through grief. In deciding to make something for her to wrap in when she needs a hug, she became my muse. I had no idea I could stitch love [...] it turned out to be a gift to me." Valerie Ogle, Ruth's Prayer Shawl, detail. "I saw magpies nesting in a tree bursting with flowers. I had to do it right down to the poem and the 3-d nest and eggs! I had never done anything like it before and haven't since either ... this quilt demanded to get done and it opened the door to further art quilts. One of those, a reverse applique of my daughter's dog - actually went to Groton New York and hung in the Main Street Art Gallery there among oil paintings and watercolors in a juried show!" "On our first day in the ceramics workshop we all moulded apples, about the nearest thing to a plain ball of clay you can think of, just to get the feel of it. At the end of the session I was the only one to ask for my attempt to be fired. The following week I held in my hand, still warm from the kiln, the wonkiest apple with the chunkiest leaves ever seen, with a huge grin on my face." "Last year I had a Grand Incubation of LARGE white grubs in my compost. I was both repelled and fascinated believing that there was some very important reason why their beetle mothers had chosen this small acre. The combination of some tacky eyelet ... and the almost rotted through walnut dyed linen is uncomfortable, but perfectly portrayed this mystery of the Earth Realm." One final group of boogie-woogiers will follow soon. The original post (with a brazen 1970's leotard-and-neck-kercheif-boogie-woogie moment of my very own) is here: Boogie-woogie.